I have yet to see Dan Gilroy's second feature, Roman J. Israel, Esq. (2017) (it seems like it didn't have any buzz, as I wasn't even aware of it until yesterday), but after his stellar 2014 directorial debut, Nightcrawler, I've had high hopes for subsequent work by him. Which is why Velvet Buzzsaw (2019) is all the more frustrating. Despite a good cast, I had trouble connecting with the vapid characters. The lack of focus on particular characters, along with lack of development for all of them left me not caring who died. I found the acting mostly poor as well (though Gyllenhaal is great in an over the top/Nic Cageian way) and there's some pretty eye-rolling dialogue (but also some funny bits). The kills are almost all very weak. For a film that is essentially a slasher (at times it feels audacious but mostly it feels like a by-the-books horror with some noir thrown in) more of the budget should have been spent on the f/x (and more practical f/x at that). While there is a definite Italian horror vibe going on (at times Buzzsaw feels like something that Dario Argento or Michelle Soavi would have made in the 90s or that Brian De Palma would have done in the early 00s), there is a lack of cohesiveness, a weak backstory, a lot left unexplained, and a letdown of an ending. 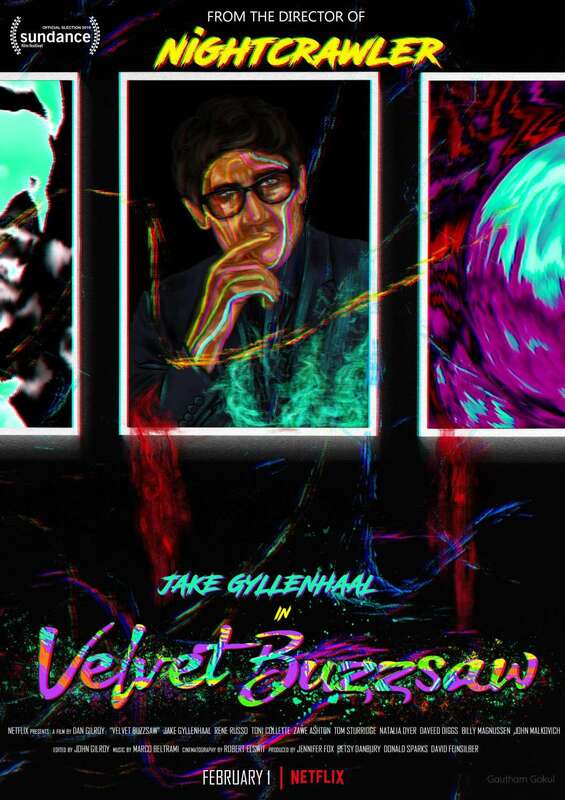 If the vision and the cinematography were strong enough, I'd probably be willing to let a lot slide (see Nicolas Winding Refn's The Neon Demon (2016)), but as it stands Velvet Buzzsaw is a Velveeta buzzkill (credit to my friend Brian Izzi for that brilliant pull quote).